Prank on the Vermont Police Dept. Who is really to blame? I found this story quite interesting. The Vermont state poilice crest was altered to have an image of a pig in it. Look close at the spots on the cow. Now, as we all know, someone has to take the blame. 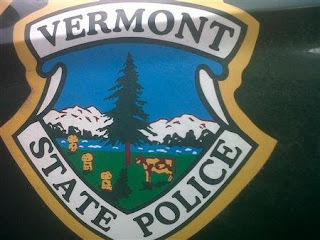 Well, it turn out that Vermont has contracts with correctional facilities employing prisoners to make some print products, including the Vermont Police Crest. Of course, the investigation is underway to find out which prisoner did it. They are pointing out how much time and taxpayer money will be wasted due to the inmates prank. But, are the inmates the ones to really take the heat? They are inmates for a reason. They appearantly did something to become inmates. Were they trusted to do this task by themselves? There had to be someone watching them work. There had to be someone to give the final proof the OK to send to the printer. The printer should have given it a final view as well. Why did everyone just trust the prisoners to do the right thing. If they always did the right thing, they would not be prisoners. So how about making sure that the people who were watching the prisoners are held accountable as well. I mean, don't just pile it on the prisoners, others share guilt in this and they should own up to their lack of job performance. As far as the prank goes, well done whoever pulled this one off. Although I support the police, I always appreciate a good prank too.